I need Your help and sooner would be better than later. Wouldn't you know it, just as soon as I decide to attempt the 5-Day Bible Study Challenge, my parents start heaping on loads of pressure to get me into Julliard. My friend Amy isn’t any better, urging me to ask Luke Ryan to homecoming. As if the cute, transfer jock would actually go out with me. I mean, we’re kinda friends, and I’ve enjoyed our Geometry study sessions, but in case Amy hasn’t noticed, I’m the invisible one at Aubrey Christian Academy, and I like it that way. On top of that, I have a feeling Luke’s concealing something behind those chocolate-brown eyes of his. I know I can be self-centered and a bit melodramatic, but I really do want to seek Your will for my life. Then maybe I’ll even figure out which direction points up. “Andrea! Are you up?” It was Mom attempting to break the sound barrier again. “Yes, Mom,” I replied through my bedroom door before pushing my comforter back and wiping the sleep from my eyes. I’d had grand plans to start my day right and even get up early. (You know what they say about the best of intentions.) Guiltily, I glanced at my desk with my journal and Bible on top, which only seemed to taunt me further. Honestly, I didn’t even know for sure if that was the life I wanted. After plopping my size nine feet out of bed and onto the carpeted floor, I hurried over to my desk and opened my Bible. I had a few extra minutes. So here it is, Lord: Day 1 of the Bible Study Challenge. I, Andrea Jamison, am following through on Pastor Jace’s one-week challenge to get into God’s Word every morning and see what awesome things You do in my life—or through my life or something. (I’m not real clear on that part, yet.) I’m even utilizing the Proverbs prayer journal Mom gifted me two months ago, which has since just been collecting dust. I know she only gave it to me so that I might actually get up early every morning and do my quiet prayer and devotion time before heading to the big building where we do all the learning. So in a sense, I’m making everyone happy with me in one fell swoop. With homecoming on the horizon at school, I have a sinking feeling I’m going to need all the help I can get. I know You can work miracles, and really I’m not asking for one, but please if I can spend one more day (or even a hundred) not making a complete fool of myself that would be great. Now I have to cut this short and get in some piano practice. Really, if I could ask for anything it would be the ability to freeze time, then I might actually get everything done. Nugget of Truth from my reading this morning: Proverbs 1:7 The fear of the Lord is the beginning of knowledge, but fools despise wisdom and instruction. Later that morning, without incident, I made it to school. Homecoming banners twirled in the breeze. I met up with my friends and even attended a couple classes, but I should have known it was all just the calm before the storm. I pressed my back into the lockers around the corner from the transfer student, Luke Ryan. My eyes fluttered closed as my heart raced. This was exactly what I feared. Help me now, Lord! There must be something in the crisp, autumn air just as the pumpkins ripen and the days grow short which infects the hearts and minds of students everywhere. I thought my best friend, Amy Appleby, and I were immune, but obviously, I’d been mistaken as she attempted to contaminate me, too. “Amy, please, stop.” I looked through Amy’s oval-shaped, frameless glasses and into her golden brown eyes. “I am not—I repeat—I am not now, or ever, going to ask Luke Ryan out and definitely not to homecoming. I’m not even going to the banquet. It’s lame.” Yes, a banquet, because at Aubrey Christian Academy we didn’t have dances. I replied with a scowling look. Of course, no one had asked me. No shocker there. And I wasn’t about to change that fact by asking Luke out on the spur of the moment in the middle of the north hallway. Frankly, I hadn’t any interest in going. At least, I didn’t think so. I was ready to respond, but the warning bell rang before I could answer. The clamor around the hallway increased as locker doors slammed and my fellow students—the majority of whom had dressed Caribbean style for Spirit Week—scurried to their third period classes. And there I stood with my mouth still hanging open just as Luke walked by. With his backpack slung over his right shoulder, he glanced at me with a slight smile. OK, I couldn’t deny he was kind of cute: tall, athletic, sun-lightened brown hair, and dark eyes. And a senior. 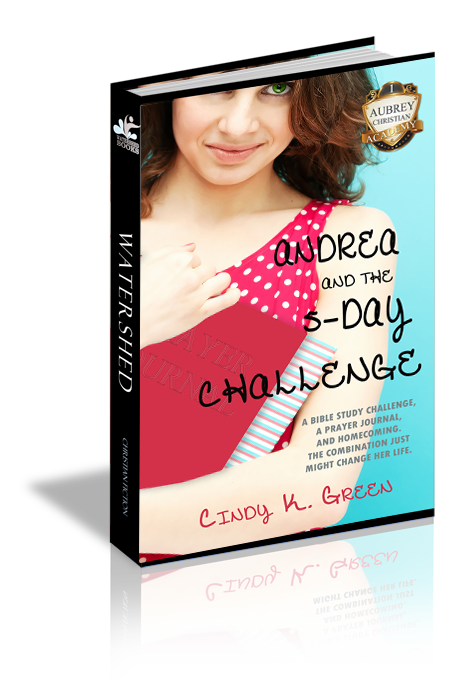 “You can close your mouth now, Andrea,” spoke Amy with an annoying grin. I plopped my mouth closed and shook my head “no” to her, knowing exactly what she was thinking. She knew better than anyone that I have incurable Change-o-phobia. Did she forget the freak-out in eighth grade when my mom surprised me by painting my entire room what was supposed to be a restful, sunset-like yellow? It turned out to be the color of macaroni and cheese. And then, there was that one particular incident last spring. I shuddered at the memory. Asking Luke to homecoming would be too big a change for my neurotic system. Uuh! Who could think of classes at a moment like this? Ever since the incident, I’d steered clear of most school activities. Did I want to break my solemn vow and re-enter the world where people attended homecoming and other functions? What was I thinking? It was Amy. She’d tainted my brain. She knew I wasn’t interested in a date for homecoming and all that it required. It wasn’t my style. It wasn’t hers, either…usually. We didn’t chase boys or go to date-required activities. We had more important things on our agenda. Things like signing up for transcript enhancing extra-curriculars, planning for the Christmas Break missions trip, and maybe even making it through the eleventh grade without another tardy to class. On top of all that, I had my recital to think about. The agenda did not include me stepping out of my comfort zone and asking a cute, popular guy to homecoming. “Come on, Miss Indecisive.” Amy broke into my contemplation. My gaze took in another poster hanging in the hallway stating the theme for homecoming—Written in the Stars. I’ll tell you what’s “written in the stars.” I, Andrea Renee Jamison, would never find my name attached to Luke Ryan’s. That afternoon I sat at a table surrounded by my lunchtime crew—my friends since elementary school. Amy was next to me. Angie Horowitz, the artist who had sworn off men, sat in front of us, with Alisha Andrews beside her. Yes, we were the four As: Andrea, Amy, Angie, and Alisha. A-Company (yes, just like in the army) was what they called us in fourth grade. Of course, that had been because our previous military-trained teacher had placed us in the same reading group, and we discovered how much we all loved to read. When we were eleven, we even started a book club and called ourselves the A-Company Girls. Our reading choices at that time were totally dissimilar, with Angie devouring every Judy Blume book on the market, Amy quoting Louisa May Alcott, and Alisha sticking with teen romances. And I…I was transfixed with Little House on the Prairie and anything with a horse in it. Now in the eleventh grade, we were still friends and occasionally met for book club meetings, even though we were no longer in the same social stratum. However, we’d made a pact back in ninth that no matter what, we’d spend lunch together. So, this table had been designated for A-Company—not that we called each other that at school or anything. “I assume you said yes,” Angie responded in her usual sarcastic manner as she flipped a strand of her long, blue-streaked auburn hair over her shoulder and rolled her hazel eyes. Alisha didn’t have to answer. Her perfectly curled eyelashes twitched in such a way above her blue eyes that we all knew exactly what her answer had been. And why wouldn’t Mike, an attractive football player, have asked her out? Alisha was beautiful and smart. I have seriously never even seen a zit on her face—ever! And that is perfectly all right. She’s my friend. I’m glad the endowment fairies were kind to her. Endowment Fairies, you know, those flitting creatures who endow you with your inalienable rights to looks, smarts, and abilities. They’d been particularly absent in my case. “Well, Andrea is going to ask Luke Ryan,” said Amy, out of the blue. My head snapped up from my cafeteria-provided lunch. “Whh…” was my pathetic attempt at speech. Angie and Alisha’s enthusiastic responses outplayed my wimpy reaction. “Cool,” Angie replied, far louder than I would have liked. “What do you all think?” Amy interrupted me. All three of them turned to look at Luke, only two tables away. It was like a slasher movie playing before my eyes, and I could do nothing to stop the horrendous events from unfolding. They were smiling at him in unison just as he happened to look our way. Being the sweet guy that he is, Luke smiled back. He didn’t seem embarrassed by the attention. I, however, really wished an alien spaceship would beam me up. That seemed less noticeable and embarrassing than all my friends staring and smiling at this guy whom I was never, ever, ever going to ask out. Luke Ryan hung out with the jocks at Aubrey Christian Academy since starting school two months ago. He and his mother had just moved to North Carolina from California after his parents’ horrible split-up. Luke had gone statewide All-star in baseball at his last school. He had hair which naturally formed in neat folds around his forehead. His complexion appeared clear, his eyes yummy, and his clothes expensive. Therefore, no way on earth would he ever accept my invite to the homecoming banquet. To believe otherwise would be living in a fantasy world. Not with my fashion-challenged wardrobe, mossy green eyes, and this shoulder-length, impossible mousy-brown hair. There’s nothing all that interesting about me. I can’t dribble a ball or do a handstand. I’m not a fanged creature of the night, nor am I in love with one. I really had little to no reputation. Aubrey Christian Academy had been around for at least fifty years and had over nine hundred students from Kindergarten to twelfth grade. I was just one of the many. To the cool kids, I was the equivalent of being invisible. I liked it that way. It was better than when a couple girls in my third grade class started calling me goody-goody just because I wouldn’t steal candy from the student store. Yikes! Heat flashed into my face as I returned to the conversation. She wouldn’t actually do such a thing, would she? “Uh, no thanks, Alisha. Amy is mistaken. I am not asking Luke Ryan to homecoming. I told her so this morning.” I sipped soda through a straw, trying to look nonchalant. I was looking at him and there was still no reason to utterly humiliate myself. Luke had resumed his conversation with his sports buddies. He swiped a hand through his bangs, brushing the hair back from his face. Yeah, he was a hottie, and while I’d thought him cute before, I’d never considered him serious dating-material. Ha! As if! We were just friends. I’d even helped Luke out in Geometry. Yes, my worst subject, but he was even more lost and taking it for the second time in his high school career. I’d never been embarrassed around him before, but now the sight of him made my whole body tremble. What had my friends done to me?